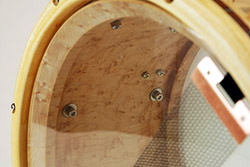 The shape and finishing of a drum's bearing edges -- the top and bottom edges that the heads fit over -- are critical components in determining a drum's sound and performance. That's because the edge is where the head and the shell make contact. The shape of the edge dictates how much head surface and shell surface touch each other; the more contact, the more wood tone and the less ring from the drum. Too much ring gives a drum a bell-like sound that can interfere with definition and clarity. Too little ring produces a dead-sounding drum, flat and boxy. Ring is the product of overtones, and should not be confused with sustain, which is more the product of shell design and wood selection. In addition, the evenness of the bearing edge determines how well the head is seated, how evenly it can be tuned, and how adaptable it becomes to a range of tuning. In fact, the edge governs how effectively the head can do its job. Consistency all the way around the head makes a drum sound great. Carolina Drumworks edges are chosen to complement the shell design and intended use. The shapes of batter-side and snare-side edges are selected individually to maximize control and definition while allowing optimal snare vibration. Once cut, the edges are progressively sanded by hand, sealed and waxed to permit the head to move freely during tuning. For drum kits, we cut graduated edge profiles in order to balance the sustain and harmonics across the range of each kit.